Bands don’t always show signs of aging by their third album, but Here We Go Magic have grown up with their latest, A Different Ship. The band was never loud and brash before, but they seem to have taken a turn for the drastically mellow on this album. They have clearly become more in touch with their later “Yo La Tengo phase” than their mystical, vibed-out phase of yore that was on trend with indie experimentalists like Animal Collective. In this vein, my initial recommendation for the album’s title track of would have been the super relaxed “Made to Be Old,” although in the end I see how the trippy, feedback-laden “A Different Ship” was appropriate. Walk with me while I explain. For A Different Ship, the band hired Nigel Godrich, known for his work with Radiohead, REM, and Pavement, to produce. His work with Beck on Mutations, Beck’s famously country and bluegrass-inspired turn, surprised many fans of the funk-influenced and Grammy-winning Odelay. 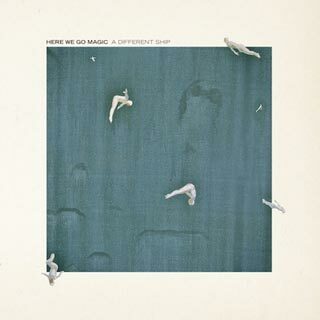 On A Different Ship, there is a familiar folky twang that listeners can associate to Beck’s Mutations, but there are definitely some electro bells and whistles and some tricked out tunes with synthy undertones that remind me of the Here We Go Magic’s critically-acclaimed debut. A Different Ship, like its title track, is a mixed bag of styles. Take “I Believe in Action,” which combines the moodiness of alt-folk with the steady beat of the band’s more electronic impulses. The vocals often have multi-layered harmonies that could be stripped down and taken alone, in a capella form (a clear sign of a well-produced album). “Alone But Moving” manages to encompass HWGM’s dreamy tones while blending their newer, more relaxed vibes into the mix. “Make Up Your Mind” harkens back to their enchanting self-titled debut in the closest form, and, with its fast-paced bounciness, was the brightest spot on the record for me. similarly, “How Do I Know” has an ear-catching happy quality that is practically two-step worthy. Tunes like “Over the Ocean” and “Miracle of Mary” that are moody but just feel flat. The songs are too bare, with little to keep one’s interest beyond a few listens. Ultimately, it’s the more upbeat tunes that make this record special; the others drag down the mood too much. As a band, progression in your sound is always good, but sometimes progression moves in the wrong direction. Here’s to hoping that A Different Ship is their Mutations — a gem of an album in its own right, which aged well and became better with more listens — a represention of a temporary move in a different direction, and that Here We Go Magic will bring more of their funk back soon.